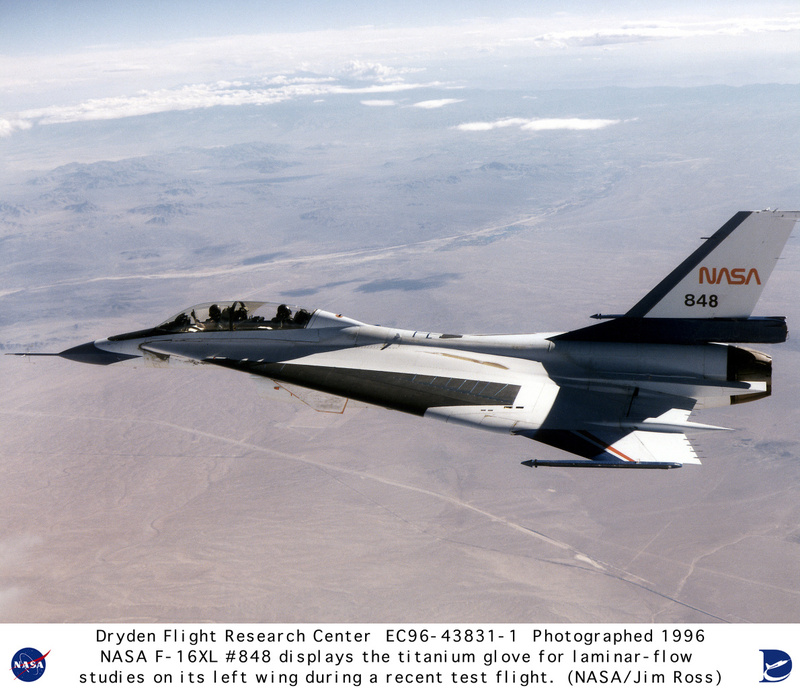 Description: The perforated titanium overlay mounted on the upper surface of the left wing is clearly evident on this view of NASA 848, a highly modified F-16XL aircraft flown by NASA's Dryden Flight Research Center in the Supersonic Laminar Flow Control (SLFC) research program. The two-seat, single-engine craft, one of only two "XL" F-16s built, concluded the SLFC project with its 45th data collection mission. The project demonstrated that laminar--or smooth--airflow could be achieved over a major portion of a wing at supersonic speeds by use of a suction system. The system drew a small part of the boundary-layer air through millions of tiny laser-drilled holes in the "glove" fitted to the upper left wing.